Reliance Jio’s live TV streaming application JioTV is one of the best perks of owning a Jio connection – it also won a global award recently. 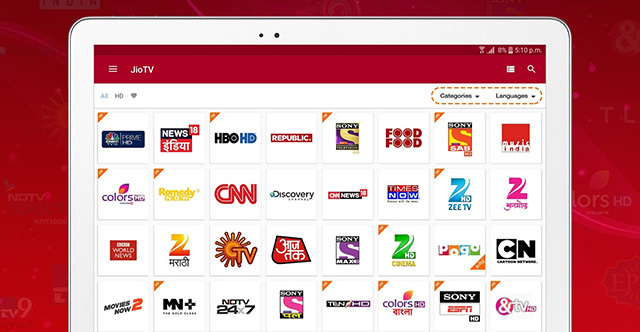 Subscribers can watch more than 300 live TV channels in over 15 Indian languages on their mobile phones or tablets without any additional cost. Users also get the ability to pause live television and create several lists of favorite channels and shows. The JioTV app is extremely popular, with downloads on Google Play Store (free) ranging between 100 and 500 million. But, it seems that the numbers are likely to shoot even higher really quickly as JioTV has acquired the exclusive rights to broadcast the Nidhahas Trophy T20 tri-series among the national cricket teams of India, Sri Lanka, and Bangladesh, according to a PTI report. The tournament is scheduled to begin later today and will go on till March 18 in Sri Lanka. Reliance Jio is reportedly working with the Sri Lanka Cricket (SLC) for an in-depth telecast of the tri-series and moments apart from the match. Apart from the live telecast, JioTV will also cover highlights and repeat telecasts. Since JioTV has the exclusive rights to broadcast the T20 matches, these will not be available on channels other than DD Sports and Reliance-owned Rishtey Cineplex. But in case you want to watch the match in HD, you’ll need a Reliance Jio connection. Besides the ease of watching a live match on the go, the exclusivity might attract many new users to Jio’s network. And in a country where cricket is more of a brotherhood than just a sport, Jio seems to be in the right position of making the best of the opportunity. JioTV recently also bagged rights to broadcast the Winter Olympics 2018 in India. Recently, Jio had announced that it will offer 10GB additional data to all users so they can enjoy watching content on JioTV without burning into their daily data limit. Although you don’t have to activate this free benefit, it is best to make sure that it is available in your account. You can do so by heading over to the MyJio app (or download it from Google Play Store) if you don’t already have it and view details of the current plan.